Former Mayor Raymond Tucker (at right) and then-civic leader and bond issue chairman Sidney Maestre look out over an area of Mill Creek Valley slated for clearance in this photograph from 1956. Gwen Moore can rattle off the names of all sorts of characters who once walked the streets of Mill Creek Valley, a historic St. Louis neighborhood demolished in the name of urban renewal in the late 1950s. General William T. Sherman lived in Mill Creek at one point. The poet Walt Whitman stayed there during trips to visit his brother, and the owner of the Daily Missouri Republican also called the community home. Moore herself was among its last residents, living there with her parents along with about 20,000 other African-American St. Louisans who were displaced by the demolition that began in 1959. Located in the city’s central corridor, Mill Creek had been branded a slum by that point. But Moore, who is now the curator of urban landscape and community identity at the Missouri Historical Society, remembers her childhood neighborhood with fondness. “My memories are very pleasant, and I remember being traumatized when we were told that we had to move,” she said. 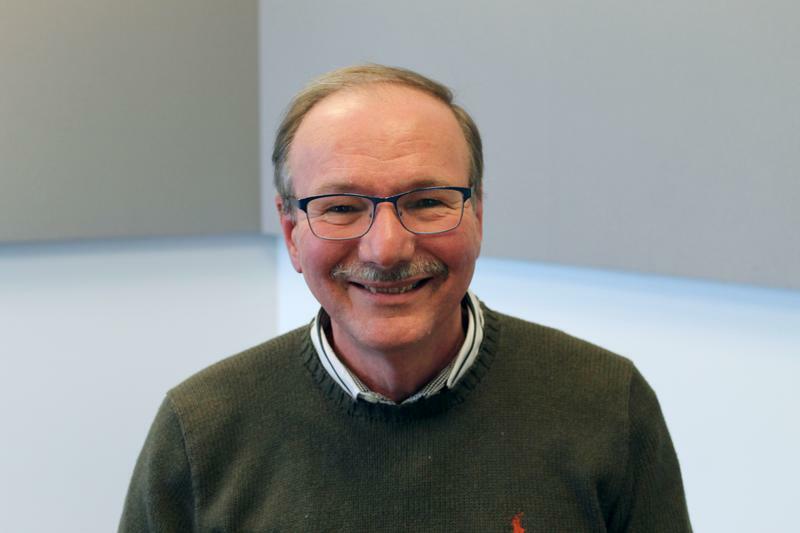 Moore joined St. Louis on the Air host Don Marsh and two other panelists, Lisa Gates and Terry Jones, at Harris Stowe State University last week for a conversation ­about the community that once existed between 20th Street and Saint Louis University. The same day, HSSU unveiled a new campus mural, commissioned by Wells Fargo, honoring Mill Creek. 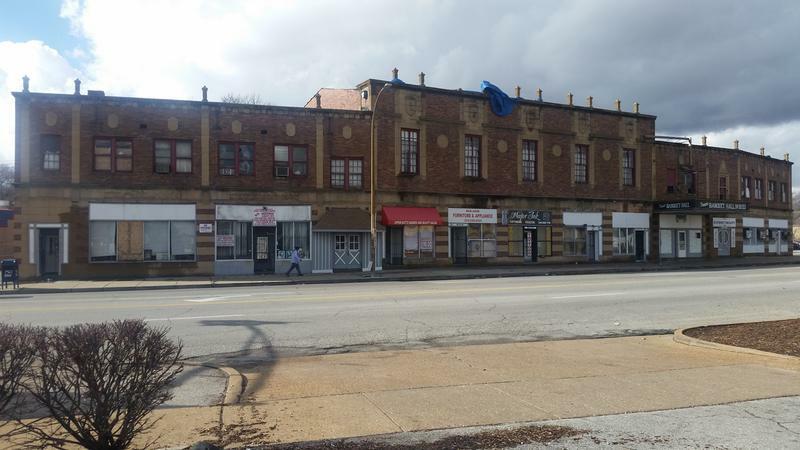 Despite the neighborhood’s nearly 200-year history and the presence of hundreds of business and institutions in the 1950s, St. Louis voters of the period approved the bond issue connected to its destruction. Jones, a professor emeritus of political science and public policy administration at the University of Missouri­–St. Louis, said that the region’s political leaders took advantage of laws that made it easy to deem an area blighted, tear it down completely and start over. 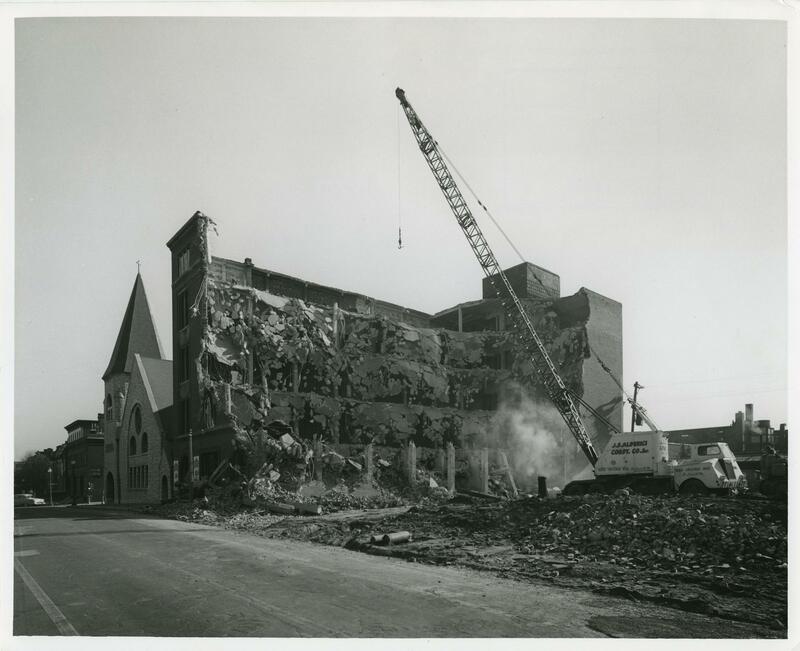 One of the largest reinforced-concrete buildings in Mill Creek Valley is demolished in January 1960. 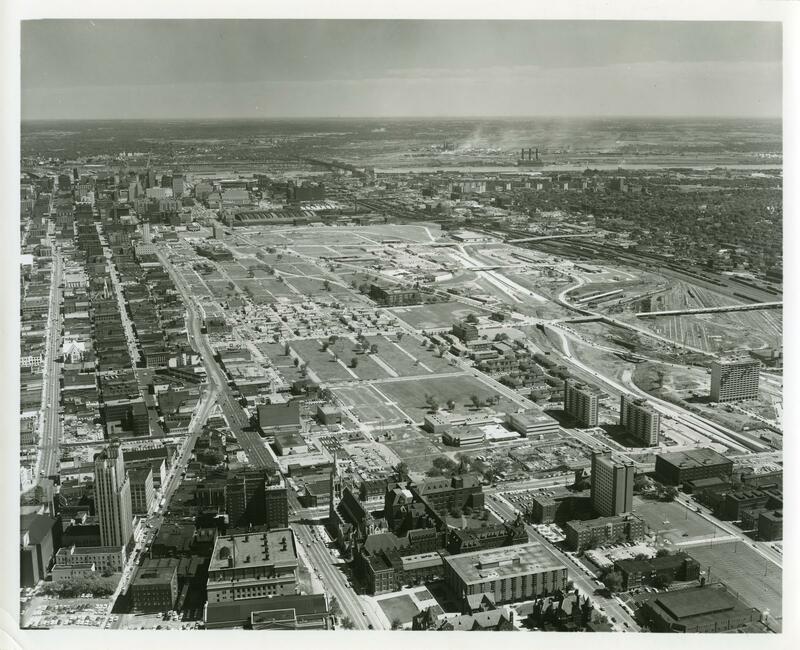 “The elected leadership, particularly Mayor [Joseph] Darst and subsequently Mayor [Raymond] Tucker, along with a new business organization called Civic Progress – now not so new in our memories – had plans for the continued economic development of the St. Louis region,” said Jones, a SLU student at the time. 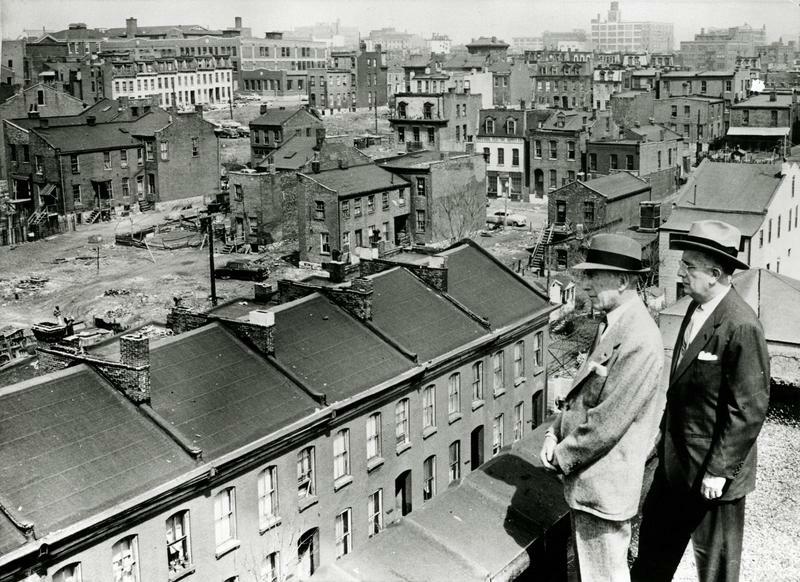 “They realized, from their perspective, it could no longer be just the city – it needed to be the city and the county. As editor of SLU’s newspaper, Jones covered the Mill Creek story and watched it all come down. He said during the HSSU event that he was “not sensitive enough” to some of the issues at play. He considers Mill Creek a “missed opportunity” as he looks back on that time and considers what might have been. Gates’ father, Clifton Gates, co-founded Gateway National Bank, the first black-owned bank in Missouri, in 1965, shortly after Mill Creek’s demise. Now the director of St. Louis’ Office of Financial Empowerment, she said she still has people come up to her and recall how her father helped them get their first loan to start a business or buy a home. For Moore, the answer was still a resounding no. The construction of the Eads Bridge a century and a half ago almost made St. Louis one of the most important cities in the country. The steel combined road and railway bridge over the Mississippi River brought rail and other traffic from the east to St. Louis and beyond.